Ronald Magarin was born and raised on the island of Maui. 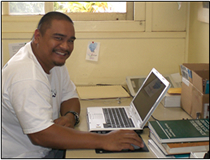 He is currently attending Maui Community College and is in the Electronics and Computer Engineering Technology (ECET) program. He hopes to work in the fast-growing technology field when he graduates. Images of objects in space obtained by ground-based telescopes are often of poor quality, due to turbulence in the atmosphere that is caused by a mixing of hot and cold air. This turbulence causes a random blur in the image, which reduces the amount of information about the object that can be inferred from the data. Removing this random blur is the problem of image restoration. The success of image restoration depends on many factors, such as the amount of data, the strength of the turbulence and constraints set by the imaging system. One such constraint is the pupil function, which describes the diameters of the primary and secondary mirrors of the telescope. Using simulations, we investigate how using different pupil functions in the restoration process affects the quality of the final restored image.